The CoffeeShop Blog: CoffeeShop Coffee or Tea? Cups! CoffeeShop Coffee or Tea? Cups! 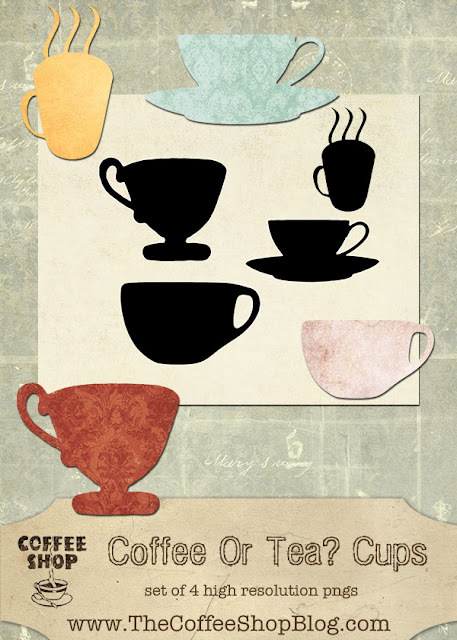 I made a few digital coffee and tea cup silhouette to use in some headers and I wanted to share them with you. These are simple png files on transparent backgrounds, and you can add colors or textures. They are great in all types of graphic design work and scrapbooking and can be opened in any editing program. I love adding a small drop shadow effect to them. Download the free CoffeeShop Coffee or Tea? Cups set! You can also download it here. Love the cups! Thank you for sharing so generously.